Osaka, Japan – Panasonic is pleased to announce the new CX Series of handheld camcorders covering both image production and broadcasting applications. Spearheading the series is the AG-CX350 Memory Card Camera Recorder, which will start shipping in February 2019. The AG-CX350 features a wide-angle (24.5mm), high-powered optical 20x zoom lens and a new high-definition, high-sensitivity 1.0-type 15M MOS sensor, enabling 10-bit image quality, 4K (UHD) resolution recording with maximum 60p or FHD with maximum 60p on to SDXC card. A new, high-efficiency HEVC codec (LongGOP, 10-bit, 4:2:0/MOV) enables*1 smooth playback and editing with a notebook PC or MacBook. The AG-CX350 also features an HLG*2 gamma mode that supports HDR image production. 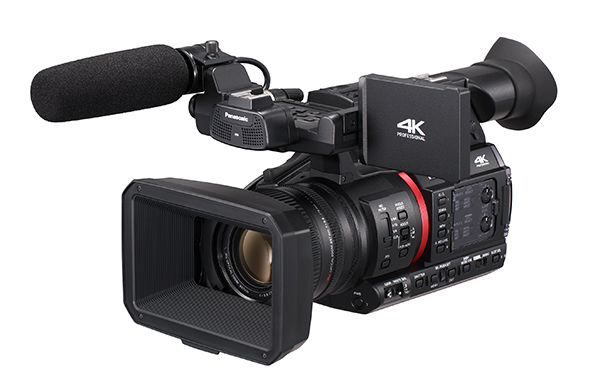 Equipped with a high-brightness, high-definition LCD and providing parallel output of SDI/HDMI, the AG-CX350 offers enhanced operation and usability, with light weight of 1.9 kg, compact size, and low power consumption. The AG-CX350 is the first camcorder in the industry*3 to provide NDI｜HX connectivity. It allows system of video transmission and camera control via IP connection for smooth production which are live events and web distribution using Panasonic PTZ Camera System with NDI and Live Production Center AV-HLC100. A streaming function is also included and RTSP and RTMP protocols are compatible. Both Facebook and YouTube Live are supported. And the AG-CX350 will support the P2 file format MXF for broadcasting in the future,*4 enabling AVC-Intra and AVC-LongG. Various broadcasting applications are anticipated. A wide-angle 24.5mm/high-powered optical 20x zoom lens and new high-definition, high-sensitivity 1.0-type 15M MOS sensor. IP (NDI｜HX) connectivity, RTMP/RTSP streaming, P2 recording compatibility*4 for broadcasting. 1: Playback is possible for signals that are native decoded by hardware acceleration from a computer installed with a 7th generation or later Intel Core i7 chip. Depending on the system environment, such as internal storage and memory, playback may not proceed smoothly. *3: The industry's first as a camcorder. As of January 2019 (according to a Panasonic survey). For use, an activation key code supplied by NewTek Company is required. NDI stands for "Network Device Interface" technology from NewTek Company.